There are many shirring tutorials out there. Fabric, thread to match your fabric, and elastic thread! 1: When first cutting your fabric, remember that your piece will be about half the size when finished, but with lots of stretch. If possible, I recommend marking your lines out first with a fabric pen or quilter's chalk. You can space your lines as far apart as you like, but most people usually make them somewhere around 1/2" apart, give or take a little. 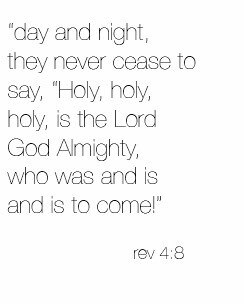 And just remember that the closer they are, the more gathered it will look! Continue to thread it through the bobbin's thread guides, just as you would with regular thread, using regular thread on top! 3: At the beginning of your first row, do a couple of backstitches, to secure the stitches. 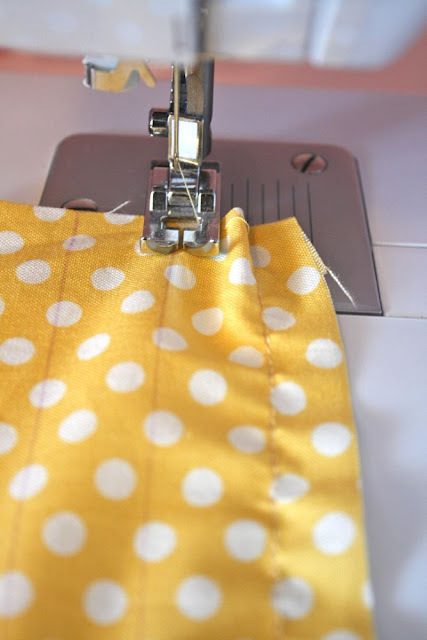 5: At this point, you can either backstitch again, and clip your threads, or simply just lift the presser foot, turn your fabric around, setting down the presser foot on the next line, and keep sewing! 6: Repeat for as many rows as you have, backstitching at the very end. Your first row won't look very gathered, but as you go along, it will pucker up nicely! The more rows, and the closer they are to each other, the more gathered it will be. And since I didn't want to waste the scrap I practiced on, I cinched it in the middle with a little bias tape, glued, and threaded a bobby pin through! 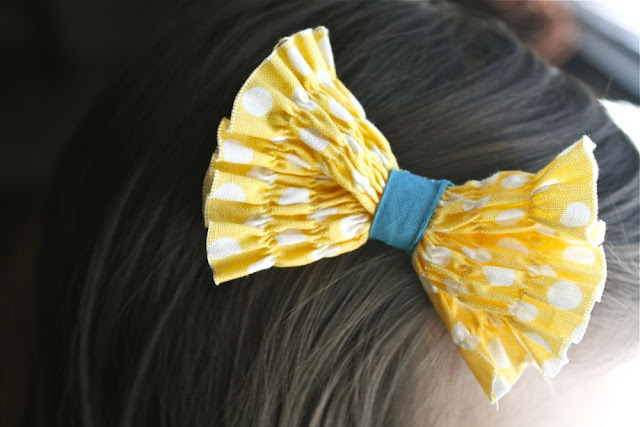 A fun little hair bow! Thank you very much for this very easy to follow tutorial. With spring comming on I can't wait to start shirring! Thanks for this. I have tried shirring before (ala Heather Ross's Weekend Sewing) and it didn't work. I did not load the bobbin properly. I have fabric at the ready and a trip planned where my girls need some clothes, so I really appreciate your "boring" (NOT) tutorial!!! Seriously, Disney...they are not boring at all. I am one of the people that has admired your blog but never felt I could do any of these things and you are really changing that for me and I am SO grateful! I am finishing a current project but after it I have a bunch of yours I want to try...and I feel like I might be able to accomplish them now! I love it!! I never knew how to do that!!! Where can you get the elastic thread? Your little girl is SOOOO cute!!! :) you are not boring!! :) you are fun to read and i love to see all your pictures - you take great tutorial pictures - and your baby is a doll.. :) so, keep up the good work! and don't feel boring. Thank you so much for this tutorial. I have always been intimidated by shirring. Not any more. You have shown just how easy it is. Now I'm off to the store to get some elastic thread!!!! Thank you for your "boring" postings lately. You've taught me so much. I never thought I could shirr, but you made it look so easy! Disney, thanks alot for this ...... been wanting to try shirring for a while but was scared. looks difficult, plus i was confused with the many variations. SHUH! This is not boring, it's really cool! I enjoy a good tut and you are chock full of 'em! I love the hairbow~! Disney, First of all I just LOVE your name, second I just LOVE your blog and religiously check it everynight to see what new project you've come up with, and thirdly I LOVED your shirring tutorial because I had NO idea how to do it so without your very easy to follow instructions I could never create beautiful creations for my kids!! ;) Keep the projects coming!! I made a bubble skirt just a day ago for my 8 year old...she loves it!! Hi Disney, I have a question about this. I have tried shirring several times and I keep having the same problem. The fabric doesn't come out very stretchy afterwards, so when I go to put it on I break the thread. Any advice on this would be great! Alida: that hasn't ever happened to me, but the only reason I can find online for breaking, is the elastic being wound too tightly on the bobbin. You could see if that's applicable, if not, maybe try loosening your bobbin tension a little? I just discovered shirring a few weeks ago and used the exact same technique and it worked so fine I am now adicted to it ;-) But what you just taught me is how it's called in English - It's called "smocks" in French. Thank you! and, well, no, your tutorials are so NOT boring!!! You're my hero! I can't wait to try this! "boring tutorial"? Are you kidding? I loved it! I am usually WAY too intimidated to sew my own clothes...but I love shirred tops/dresses...and this tutorial made me realize how easy it can be to do! I may just make myself a shirred top come summertime! I had no idea it was as simple as gettting elastic thread! I really enjoy your tutorials. So informative with great pictures. Not boring at all! Even those that are not new to sew can always use refreshers. You can always learn something new! I love shirring! It looks so difficult, but it is soooo easy!!! It gives you a big bang without much effort. I made my daughter quite a few sundresses last summer and they were soooo cute! I can't wait to do it again for this summer! Now if you could teach me how to serge, I would love you forever! I am so nervous to try it, but today is the day, I am actually going to pull it out of the closet! Wish me luck! I did not know what this was called, much less how to do it, but have always loved the way it looks, now I know the name and process :) Thank you!!! And for us novice sowers, well, at least for me, these post are GREAT and not "boring". Thanks again. No THANK you for posting the basics for people like me who are right there! I'm trying to teach some friends along with learning more myself so your basics have been perfect! I appreciate the tutorials so keep them coming. I have learnt more from you than from the sewing class I dropped out from! Awesome tutorial!! I've always avoided shirring because all the instructions I've read have you tie each end of the elastic into knots and that seems rather fussy to me. I don't know why it never occurred to me backstitch, but I'm definitely going to give this a try!! I ADORE your blog! I love your tutorials, they are super helpful! And they are just as good as the "fun" project ones! I'm so glad you decided to do them! Thank you! What a wonderful tutorial! 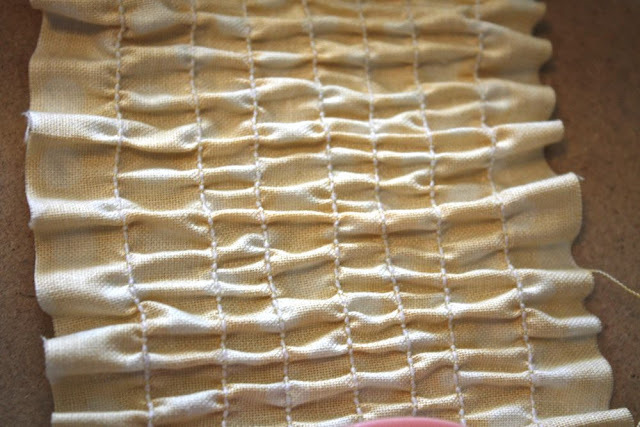 I've been wanting to try smocking/shirring for a while now and this is PERFECT!!! I'm off to buy elastic threat TONIGHT! I have a sewing maching with a drop-in bobbin, not a bobbin case....and I CAN NOT for the life of me to get it to shir....it just ends up sewing and being a little stretchy but nothing like the way it is supposed to be. Anyone have any suggestions for a drop-in bobbin girl? They are not boring at all...very informative for us novice sewers. It's like a free class. The closeups are so helpful. Bought my elastic thread and can't wait to make a jersey scarf. What are you talking about? Boring? No way:). They are all so good to know! I had NO idea how to do this sort of thing... or what it was even called! Thanks so much for posting! That's the best tutorial I've seen on this technique though. Thanks! Your tutorials are anything but boring. Your blog is so creative! Thanks for showing us your tips and tricks. I mentioned you on my blog today! I am so thankful that I found your blog and I am so thankful for the tutorials. I used to sew and I am now starting back so it is like learning all over again. And you have been VERY helpful! Thank you so much. You are so creative!!! This is exciting! (the antonym of "boring")Can't wait to try! Thanks for sharing your know-how! Oh no! I promised myself no trip to the fabric store today and now I need elastic thread. LOL! I love your blog and I plan to make knee highs out of a pair of old tights today. This is not a "boring" tutorial! It is much appreciated... I can't wait to go try it! They're not boring!! We love them and they are so helpful!! Thanks for all your hard work. They are not boring! I appreciate them all, I've been following you for a little while. Every day I can't wait to see what you've got for us next! I've tried to do this before and it did not work... :( I'll have to try again, hopefully I loaded the elastic wrong. Perfect! I had just purchased some elastic thread a few days ago in the hopes of learning how to shir some sundresses for my daughter. Great tutorial, Disney! This is NOT a boring tutorial, I needed this, I have so much cute material just waiting for me to practice something new! Thank you, I love you blog! Thanks for the tutorials. This one looks fun. You have a great blog and lovely talents. Thanks for sharing! Please don't apologize for these posts! They are wonderful. Keep them up! Thanks for another great one here. It inspires me to try it out! I have a blog award for you over at my place! I recently discovered your blog and LOVE reading your posts :D Your tutorials are AMAZING and I want everyone to know about your blog!! Thank you! I am so glad I found your blog! I sew, and tutorials are always helpful, even the most basic things are sometimes forgotten or missed. Love,love, love your ideas and creativity! Thank you Thank you Thank you!! I read another shirring tutorial earlier this week and COULD NOT get it to work out right. They didn't mention you should use regular thread on top! I was trying to use elastic thread on both top and bottom and almost ruined my machine! This post is truly timely as I just tried that two days ago and was so frustrated that it wouldn't work! You inspire me! Thanks for sharing your talents with everyone! GREAT TUT! I love following your blog you have the best ideas and you make me want to tackle the BOXES of old girls clothes! Thanks. Not boring. I love the basics. Reminds me of things that I can do or was afraid to try. Thanks for the tutorial! I've tried shirring before and it was a lot of fun, but it was frustrating to sew more than a couple lines. 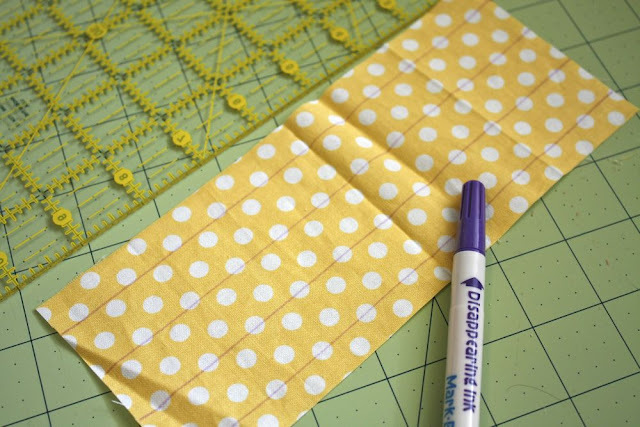 Do you stretch the fabric to keep it from bunching as you sew? I have drop-in bobbin as well and it is not working. I tried to use my old machine with the bobbin case, and it was working, but then I think I might have burned it up. oops. anyways, how can we get it to work for a drop-in bobbin? Great tutorials! Great website! I love it and thank you for teaching us!!! I love your tutorials!! Thank you so much for sharing them all! I can't wait to have some time and supplies to start! Adorable, Miss Disney! Thank you for sharing! Drop-in Bobbin Ladies: I couldn't find much info on that, but I added a couple of suggestions at the end of the tutorial! Good luck!! I LOVE LOVE LOVE your "boring" tutorials. I'm from a family of sewers, from as far back as I can remember, and I don't sew (much, I've played around with spat patterns and coffee cozies, which turned out nice, but I always find the pattern is OFF). But I want to, so these ideas and tutorials are wonderful. Now, to get my sewing room set up pretty. This tutorial came at the perfect time, I was just going to search how to sew with elastic thread. Thank you so much. I've been a daily follower of your wonderful blog since the day I found it! 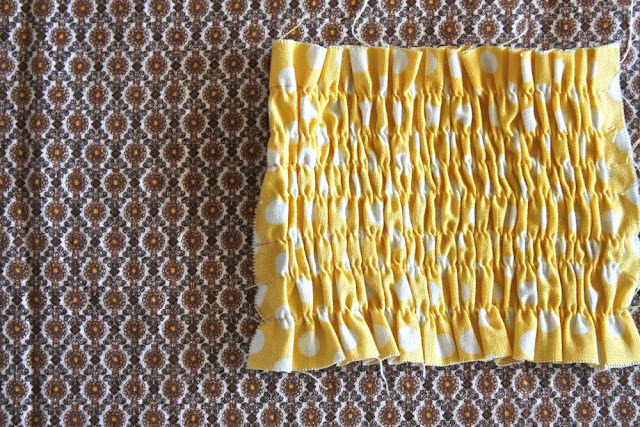 I'm soooo excited and thrilled that you've posted a shirring tutorial. Like alot of other people I've wanted to know how to do it but have been to afraid to try thinking it was much more difficult. I can't wait to do this and make summer dresses for my daughter. Thanks so much and I look forward to lots more of your "boring" posts! FYI-These are sooo not boring. I am just learning to sew and I love every single one. It helps makes since of it all. I don't feel nearly as oevrwhelmed as I use to. Thanks abunch! Not boring at all, very helpful! The photos are great! I'M A MINISTER'S WIFE, TOO, AND I HAVE HAD TO PINCH PENNIES IN THE PAST. MY KIDS ALWAYS HAD VERY NICE CLOTHES THAT MY MOM, MY M-I-L, AND I MADE! I MADE MATCHING OUTFITS FOR MY DAUGHTER AND SON FOR EASTER, ETC. I EVEN MADE THE LITTLE BOW-TIES THAT MY SON NEEDED FOR HIS BEAUTIFUL LITTLE SUITS! THE OLD WAY THAT WE USED TO SHIRR IS TO PIN THE TINY ELASTIC ON EACH OF THE BEGINNING LINES TO BE SHIRRED. THEN, ON TOP OF THE ELASTIC, WE SEWED A TINY, YET CLOSE, ZIG-ZAG. IT'S FIDDLY BECAUSE OF HAVING TO PULL A LITTLE ON THE ELASTIC. BE SURE TO SECURE THE STITCHES AT THE BEGINNING AND END. 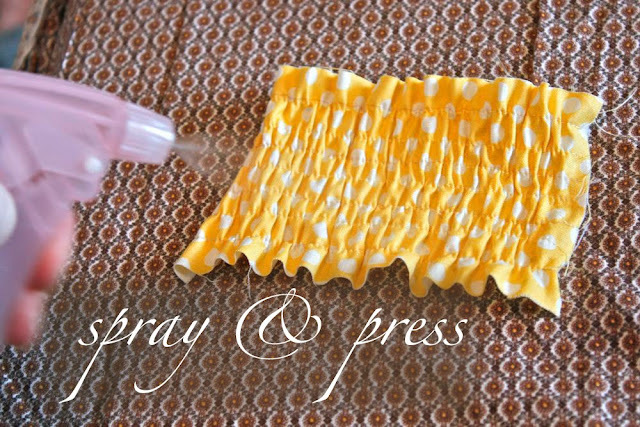 THEN SPRAY WITH WATER AND PRESS TO GET YOUR FABRIC TO GATHER MORE. THIS WORKED WELL, BUT I'M GOING TO TRY YOUR WAY, TOO, BECAUSE IT'S MUCH EASIER. HAPPY SEWING! Great tutorial! I usually use my iron at the end and give it a few shots of steam and watch it pucker. I'm crazy like that. Watch out! It's addicting! Don't apologize! I'm sure I speak for MANY of us when I say that I don't know all the basics yet, or that it's nice to read how someone else does it! I have been waiting (or hoping) for your shirring tute! I've always wanted to try, but never knew how. Thank you! Can't wait to try some shirring! Oh and I made a ruffley Antropologie inspired shower curtain out of a white flat sheet too! I wonder if we made the same one? I dyed my sheet in strips so that it would be varigated shades of green and then ruffled each one and sewed them onto another flat sheet. Which one did you do?? The timing for your tutorial could not have been better for me! I've just recently started sewing clothing for myself (not counting those jams I made when I was 12) and am planning to make a dolman sleeve top out of a fluttery fabric. I wanted to create a shirred bottom edge to fit round my hips, and this looks just perfect! Thank you! You make this look so easy that I am going to try it! love the shirring - I bought some elastic thread a few months ago and never used it...you have inspired me to try it out...finally! NOT boring. HELPFUL. THank you. I tried shirring for the first time this week and ended in tears. Then I saw your blog on craft gossip with this tutorial and I am motivated to try again. Thank yoU! I love your blog. Your tutorials are never boring, and very much appreciated! Funny, I've been planning to do a similar tutorial! You're right, everyone keeps asking :). I never thought of spraying with water before ironing though. great tip! I think your basic tutes are so helpful for people. Not boring at all! Wind your elastic thread tight. Not stretched out all the way but more that just a little pulling. I did it that way a few times before seeing a tute that said that you should wind the elastic without stretching. So it tried sewing with the bobbin not wound tight and it was total failure! I had to pull out all of my stitching. Also I raise up my tension on my upper thread a number or two. (I don't think my bobbin thread tension is adjustable. Cheap machine.) I normally sew at a 5.5 or 6 and I up my tension to a 7 or 8 when sewing with elastic thread. Thanks for all of your hard work. I love your refashioning tutes so much! I use steam to cinch up the elastic. This really tightens it up. Just give the elastic a burst of steam from the iron. Works like a charm! I am so LOVING your recent posts. Thanks for sharing all your great ideas. THANK YOU for posting this in detail. I have been wanting to make a summer dress with a shirred top for my little girl, but never could figure out how to shirr the fabric. Many thanks!!! Thank you! I just tried shirring last week and it turned out great! So exciting. I love the bow idea, never thought of that. I love your website. Super cute stuff and inspiring! Thanks so much for the basic sewing tutorials...you make it all so EASY! I am going to start sewing since I will be finishing Grad school in May and have a darling daughter to dress....SEW fun! I really appreciate all of the tutorials, photos, inspirations and most of all TIME that you have put into all of this....VERY helpful! You featured my Sorority Sister's Taggie blanket yesterday which got me hooked onto your blog...THANKS again! You are the best, I've been dying to figure that one out! More drop-in bobbin advice: I have a Janome DC3050 and this is what I do: I wind the bobbin without any stretch, decrease the bobbin tension by turning the screw, located on the bobbin case, counter clockwise about half a turn with a little screwdriver and increase my stitch length to 3 (usually it's 2.2). The times I forget the bobbin tension, the elastic stretches too tight. I just wanted to say thanks for the advice! This saved me many hours of possibly not solving my problem. I am so excited... I have tried this, but to no avail it hasn't worked. I followed kimberly's tips for the drop in bobbin and I shirred tonight! Thank you soooooooo much!! Now I'm off to bookmark & check the rest of your blog! Thanks for the tutorial. I am no master at this stuff, but I saw another tutorial on shirring and it looked soooo easy I had to try it. That disaster lead me to your blog, which was a great discovery, but still no success with the shirring. I am at a loss. I do have a drop in bobbin. (Bernina 1630 '96 update) I have loosened the tension on the bobbin case and adjusted thread tension every way that I can. All I get is a straight stitch with no stretch or gather to it at all. Any thoughts? I just found your site a couple weeks ago and I already have projects lining up! I love love love your blog! Your tutorials are wonderful and so easy to understand! I plan on trying my hand at shirring, which is just fabulous unto itself! :D I've also passed your site along to my best friend, who made your Chanel inspired cuffs last weekend. Fabulous! Super excited to get back into sewing and try my hand at skirts! Thank you so very much Disney and God bless! Thanks so much for your tutorials. I haven't sewn in many years and am having a great deal of fun relearning all that I have forgotten. Your tutorials are a great help!! Wishing you many happy days of sewing. i love your blog! What an awesome tutorial! I have seen alot of this shirring lately but didn't know how to do it. You give so much detail. 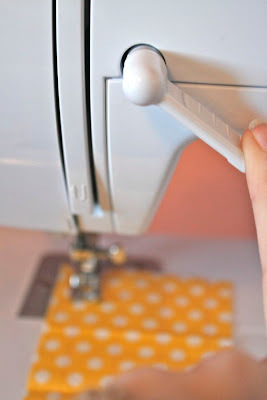 I am kinda new at sewing, so i love tutorials like these. Thanks so much! Thank you, my life has changed!!! It's so easy with this tutorial, unbelieveble!!! we are drop in bobbin girls....IM a SORRY but every and all tutorials are different just as machines are....you can have the exact same machine but I guarantee you they will be different...like human twins. Anyway I am on day 5 of this monster called shirring and on my 4th spool of elastic thread. I have a Brother 900D with a drop in. I am sick...nothing has helped but Kimberly that had a recent post had a suggestion that I am going to try.....Have you all seen the new stuff called Texture Magic? Anyway....I am not a fan of shirring (YET) Thanks Kim for the info and good luck Marla. Great tutorial! I have some vintage pillowcases that I've been wanting to turn into dresses but couldn't decide on what treatment to use on the top. I think a shirred bodice would be beautiful! Thank you for the amazing tutorial! I have a drop in bobbin and used my sewing machine to wind the bobbin and it was magic! I can't wait to sew myself a dress with this technique! I don't know if you are checking your comments on your blog any longer - I hope so!! but I finally picked up the elastic thread yesterday and gave it a try today. I also have a drop-in bobbin and I used my machine to wind it as you suggested in your edit, it worked wonderfully! I am so so excited about the possibilities. Once again, you are incredible! I hope you are well and even though I don't know you, a piece of my little creative heart is lost without you. :) Take care and thanks again for your inspiration! Wow, I didn't realise you actually pop the elastic in the machine to sew with, I thought it was sewn with thread too. Thank you for clearing this up and now it makes sense, can't wait to try this out. People like me who follow you, follow you for this reason...LOVE IT!!! Thank you so much for the tutorial and for the tip about drop in bobbins. I've been way too intimidated to try shirring, but now it doesn't seem so scary. Thanks!! Disney, This is a super tutorial! I thought I'd tried everything, but I've never done shirring. With a granddaughter to sew for, I just might. Great job! Love the photos. Thank Thank Thank I have been trying to learn how to sew and have bought 2 machines and I could not get the hang of it. But because of you I am really to try out what I have learned. Wow! Thanks so much! I've just started quilting (using a machine) but saw your tutorial and just had to try this as I've always loved shirred clothing. I followed your instructions and it worked perfectly! Can't wait to work out what I'm going to turn my newly shirred fabric into!! Thanks again! i love yer tutorials and this one really inspired me to make a dress fr my daughter....but my fabric stretched way more than half,,i think by the end of all the shirring i had only 13rd of the fabric left........i dunno wots rong...pls help!! Thank you so much for the easy to follow tutorials. Brilliant! Thank you for posting this. It's such a simple, straight forward tutorial, which I love. I'm going to try shirring for some maternity tops. This is a wonderful tutorial. I have a project that calls for shirring, and I bought the elastic thread, but I had no idea what to do with it! You made the task so simple. Thanks so much. I tried and tried to do this shirring and bobbin as it was suggested. If I just hand wound it or machine wound it by just putting it on the thread spool it wasn't near tight enough. I have to put it on the bobbin winder and pull it TIGHT. Otherwise if I hand wound it, and tried sewing it this way it was very, very loopy on the back side. I tried it different ways pulling a little tighter and never worked until I pulled it really tight like...stretching it out...but not to the full limits of course. Beautiful shirring....great fun!! Thank you soooo much, Disney! I just went through a bunch of your Sew Basic tutorials. My friend gave me her old sewing machine, sans manual. I'm a total newb, so I was totally lost. But thanks to your tutorials, I've learned to thread the machine, wind the bobbin, cut my fabric, sew a straight line and shirr. Last night I made my first garment! It's just a tube shaped maxi dress dress that is shirred at the bust. But I'm so proud of myself for making something I can wear in public. Thanks for being a great teacher!!! This was exactly what I was looking for. How to know what size to cut the original before shirring. I just tried it on a t-shirt for my teenage (as a skirt) and she loved it but it was a little big. Thanks soo much for shirring (hehe) these with us! I have been sewing for at least 50 years and have never know how this was done. I will be trying it very soon. I am so glad I stumbled on to you site. Thank you. Thanks so much for the great tutorials! 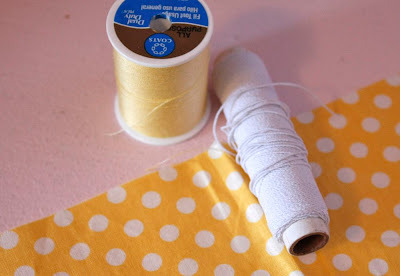 I'm a sewing newby, so I absolutely appreciate the basics! I think that this is very useful to a lot of people. I tell lots of people about the sewing blogs. THESE ARE NOT SEWERS, they are new. So I thank you a million becasue this is so easy and fun. The projects they will make will look fabulous. Thank you so much for the tut! I tried hand winding the bobbin and I was sad when it didnt work. I came back and read it again and noticed the comment about the drop in bobbin. I was SOOO EXCITED that it worked this time. Thank you! 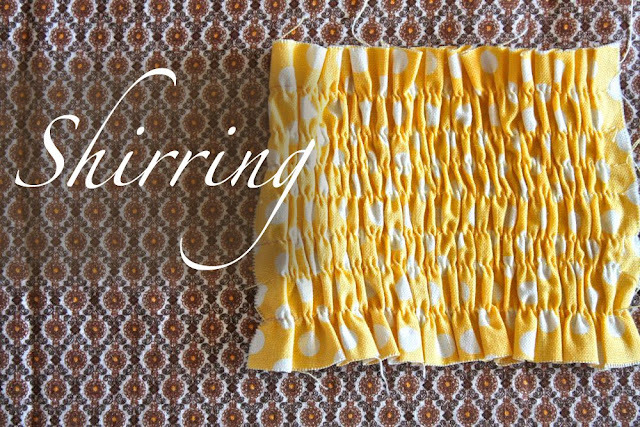 Love your shirring tutorial! It really helped me with the finishing part of my project. I have a quick question though, and I wondered if you might have an opinion on it. I'm working on a shirred top, and since it's supposed to shrink about half (my pattern says this as well), the book called for two pieces of bust-width fabric. But my shirring only shrunk by about 1/3rd, so the top is too big by about three inches on the front and back. I did the steaming part and checked that it was shirred correctly along the back side. Everything is as it should be (seemingly) yet it's still too loose. Would you happen to have a suggestion about this? Thank you for this lesson. I have a beach towell cover up to make and it uses shirring and had no clue how to do this. The tip about the bobbin is gr88888!!! what a detailed tutorial thank u for sharing. Making some 1950s style bathers and this is the best tutorial I found! Clear photos and instructions and thrilled with the result! I realize this post is forever old, but I found it via pinterest. Question. So I've made a couple onesie dresses (basically sew a skirt to the outside of the onesie), but have problems with fit sometimes because the onesie loses stretch when you sew on the skirt. Could I sew on the skirt using the elastic thread on the bottom (like one row of shirring) to keep the stretchiness? Jennah: hmm, I've never thought to do it that way...maybe? I guess it couldn't hurt to try! I usually just use a zigzag with a short stitch length. This is SOO helpful! I didn't realize it was that simple. I'm definitely going to try this very soon. Thank you sooooo very much for the information on how to fix the drop in bobbin problem!!! I was just about to give up when I came across your tutorial with the updated info (and I looked at a LOT). And for Jessie - only use the elastic on the bottom (bobbin) normal thread on top stitching with the fabric right side up. Disney - just wondering what your thoughts are for the grain of the fabric you shirt. Would it be best on the warp or weft? I don't find these boring. I appreciate that you are concise and dedicated to helping everyone. Thank you. Thank you for posting this tutorial. I have been curious on how to shir and this has helped to spark many ideas. 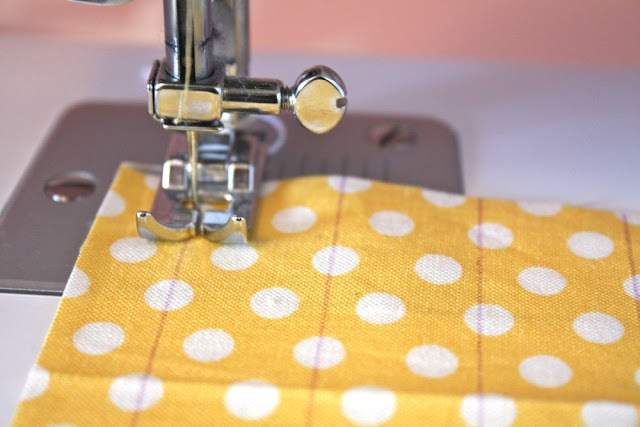 I have been looking for a good tutorial on shirring using a machine! This popped up on Pinterest for me this morning, now I think I'll be off to sew a couple of dresses for my little girls! I will try the bow, sooo cute!! Thanks for this. It makes me feel brave enough to give it a try... I think! I haven't sewed since my girls were little, and amateur at that. My daughter got me a new sewing machine in hopes I would get busy and make my grand daughter some cute stuff. You site is such an inspiration and a huge help. Thanks for sharing. Thank you so much for this "boring" tutorial! I have been so terrified and intimidated by shirring, but you make it look easy! I'd consider myself a very confident beginner, so I love seeing posts like this that help me add to my tool belt of skills! I'm so glad I fund your blog (through Sew Can She)! Thanks so much for this tutorial - so useful! Now I know what I was doing wrong, thanks so much fot the clear tutorial !!! I had a machine that shirred beautifully. then it broke. I bought a machine that had a drop in bobbin....and then could no longer shirr. I am so excited to try your tips for that. Thank you SOOOO much!!!!!!! Once again outstanding! Thanks so much for ALL you do and share! Awesome! Thanks for the tutorial. I'm relatively new to sewing and made a sundress for my daughter. I wish I would have known this then. I ended up sewing channels in the back piece and threaded 1/4" elastic. Bulky, but effective. Next time, I'll give this a shot. It seems so much easier! I stumbled across your site quite by accident, and boy am I grateful.I'm relatively new to sewing and sometimes I'm more adventurous than knowledgeable. I made a halter style summer dress for my daughter last summer and ended up sewing channels in the back panel and threading 1/4" elastic. This is so much easier. I now have a new summer project lined up. Thanks for the easy and informative tutorials. You're now one of my go-to sites. Keep up the great work! What an awesome tutorial!! You make it look sooo easy!! Thank you for taking the time to put this tutorial together!! Thanks for the "boring" tute! I now know how to shirr and it's gonna come in very handy with 2 little grand-daughters. THANK YOU!!! Shirring has always been something I have looked at and run the other direction as fast as I can. Your tutorial makes it look and sound like something I can actually do. It doesn't seem like that "monster" that I want to run away from anymore!! Thank you so much for this tutorial. I've always been afraid of this process thinking it was for advanced seamstresses, but I feel confident to experiment now.